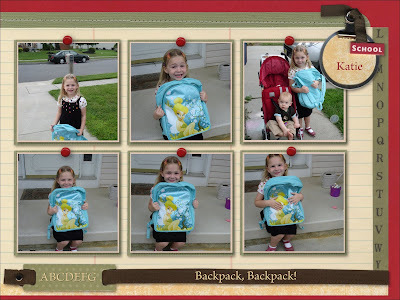 Last Tuesday was the day, the day that Katie looked forward to all summer! 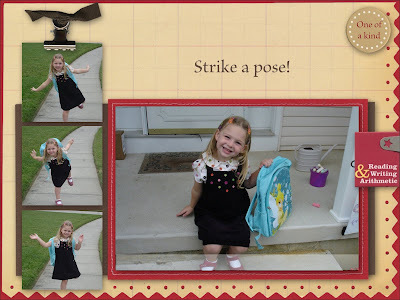 In all of her excitement, she forgot to throw a fit over her clothes and jumped on the "wants to look pretty for her teacher" bandwagon. I even got her to wear the shoes I had picked out...for 5 minutes. At least before she changed them I snapped a few pictures. Later in the evening she had her first dance/gymnastics class of the season so many of her school day poses consist of her attempting a ballet or gymnastics position. Since she is in the afternoon session this year, we were ready many minutes early. She picked how she wanted to wear her hair and was very enthusiastic to wear ALL of the new barrettes I had bought. We finally moved the party outside. The bus pickup time was 12:50, but an eager Katie cajoled me outside at 12:35. Comfortably changed into her old sneaker Mary Janes (which incidentally I'm not sure HOW they can be comfy since they are size 11 and she is now wearing 12 1/2W), she wanted many pictures with her new Tinkerbell backpack. And we waited and we waited. Things got a little silly. We took walks back and forth on the sidewalk around our house to calm a getting sleepy Timmy. Demands for more pictures were followed by interesting poses a la the Karate Kid - although I believe Katie was pretending to be posing on a balance beam. And then, FINALLY, at 1:30 (yes, really) the bus finally arrived. 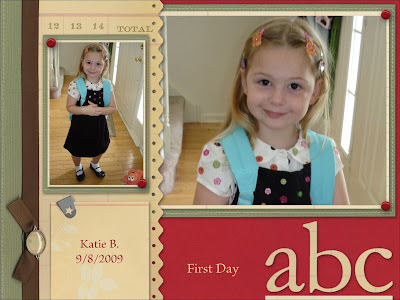 Katie didn't care that class was supposed to have begun a half hour ago; she was ready, without a glance back at mom. Of course I had to shriek for her to stop and turn around for a picture. I didn't care that the bus was 40 minutes late already. Katie had a few suprises for me when she came home that day. She was in a NEW classroom, with new toys and new books. I wondered why they had moved rooms. I had been told at my June IEP meeting that she would be in the exact same class, with the same teacher and the same kids - just switching from morning to afternoon. After questioning Katie and a frantic call to her new teacher I got a call back the following day. I found out that there were too many children in the afternoon session and that they had created a new class. They put the kids new to the program in this class and then rounded it out by taking one or two children from each of the other classes. So Katie was moved. I was very very sad for her because I had been telling her all summer about going back in to see Miss N and even more exciting for her, seeing all of her classmates that she has become such friends with. I am furious that I wasn't imformed of the change before class started. Suprisingly though, Katie didn't seem to mind at all. Her one friend from her old class also moved with her and that was very exciting to her. Possibly too exciting. I haven't received any notes home, but Katie has been telling me stories that lead me to believe that the two girls are getting into a little bit of trouble together. At first I was also bummed about the switch from morning to afternoon session. I loved that she would get home at 11:30am last year and that we then had the entire day to do whatever we wanted. It was a great time to visit the zoo, which closes at 5pm. Now, she is gone from 12:50 to 3:35. It kind of ruins the day. However, I am loving the casual morning routine: no jumping out of bed to get her fed, dressed, and on the bus; no first thing in the morning battles over clothes. Tonight is back to school night and I am very excited to meet her new teacher and see her new classroom. I'm also eager to hear what she's been doing and how she's been behaving. Hmm, it's almost like it's MY first day of school. Although I was oddly emotional to have the school year begin again, the time to myself (yay, school coincides with at least part of Tim's afternoon nap), Katie's excitement, and looking forward to some "mom" time tonight Makes My Monday. I miss the first day of school routine! Sounds like Katie had a great time. Sounds like Katie had a a great time!! I hope that her excitment continues throughout the school year!! Good luck tomorrow night with meetin her new teacher and new classroom!! I would probably be upset also with the change without being notified but it seems like she is happy so I would just go with it and see what happens!! Visiting from MMM. 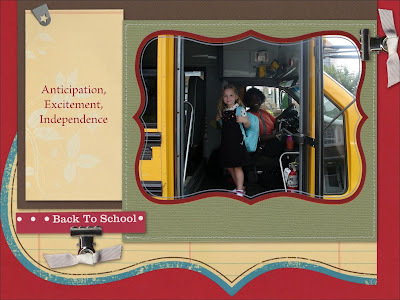 Sounds like Katie had a much easier time of the switch then mom :-) My youngest (for now) started Kindergarten this year and I wasn't prepared for how independent and ok she is without me! LOVE all of the silly poses. She's such a goofball. ps I am officially moving to PA on Thursday... by chance are you available to visit on Wednesday? What a doll baby she is. And I would SO have been as frustrated and irritated as you were after "building up" what you expected the school year to be only to have things "shift." But you are FAR wiser than me to let her be "okay" with it! (Think we all too often project our feelings---or maybe more ME projecting MY feelings!---onto our kids. Your school system is so different to ours.